Hey, I have an idea. Let’s put kids of all sizes and weights inside a trampoline-like ride shaped like a castle, and let them jump up and down! Then we’ll have a 20-something kid sit by the door and charge admission. Let’s face it: If the “bounce house” or “bouncy castle” were proposed today, chances are, it wouldn’t pass current safety standards. But because we adults remember bouncing around in them with our siblings and BFFs back in the day, we poo-poo the idea that maybe they’re not all that safe. Just avoid bouncing near the big kid doing flips in the corner, and it’ll all be okay. Right? The number of bounce house injuries increased from about 1,000 in 1995 to nearly 11,000 in 2010. A quarter of the injuries were broken bones. A quarter were strains or sprains. About half were caused by falls. 16% of accidents were from collisions. More than a third of the injuries affected kids 5 and under. 31 children were treated daily by emergency rooms, or one child every 46 minutes. Other injuries involved the bouncy castle blowing away. It appears that no one interviewed for the articles is sure why there was such a dramatic increase in injuries from bounce houses, except perhaps that kids use them more often these days. 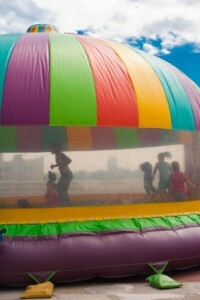 In fact, you can buy your own “residential” bounce houses for under 400 bucks, and commercial ones for less than a grand. That way, your kids don’t have to wait until the fair comes through town next summer to get their bounce on. I’m guessing it’s increased use. They used to appear at fairs, and now they’re at every birthday party.